Thank you all who were praying for Kinley(previous post). They confirmed that she had ecoli in her blood stream and not sure how she got it. The doctor that she saw in Boise was mis-treating her and the meds. they had her on was what was making her soooooo sick. She came home Friday night from Utah and is doing great! I got an email today from a friend today about another friend about another friend about another friend. No not really all those friends but I did get a disturbing email today. My friend Kelly has two little girls and the younger who is just about a year old has been quite sick for a while now. She is having kidney problems and just recently they found that she has a blood infection. After dealing with the local dr.'s and not being able to figure out what is going on they went to Boise with no luck. Today the headed for Salt Lake to Children's Primary Hospital to hopefully be able to get some answers. The nurses told Kelly that there was no time to waste and get there ASAP. Please pray that 1) the Dr.'s would be able to find out what is wrong with Kenley and treatment could be started immediately and they would get the best dr. for them and their situation and 2) that they would find God through all of this and that His will will be done. So you never know what you're going to find out when having a conversation with Than. Or better yet when you hear Than playing with his toys and the conversations he has with himself. I was on the computer blog surfing when I hear Than whistling a tune. Neither Tony or I can whistle so I was quite impressed with what I was hearing, careful not to say anything that would make him stop. Tony came down stairs and was getting ready for work and he heard the sound too. Tony: Is that Than or Dani? Tony: Oi, where did you learn to whistle? I know I can, I know I can, I know I can!!!!!! We finally accomplished what we started this summer. After much frustration and many tears from everyone, Dani has finally taken off on two wheels. We didn't really have plans to ditch the training wheels this year. Tony ran over the training wheels so we had no choice and I refused to buy new ones. She was going to learn how to ride a bike. I tried, Tony tried(anyone who knows Tony knows that was a short lived experience), and Chante tried. We bribed as you will see in one of the videos. Chante had told me about a thing that you put on the bike to help them balance but you don't have to brake your back trying to hold onto the bike, and they learn quickly. What did I have to lose? I went to Target and bought the Balance Buddy(the funny handle on the back of the bike), that was back in July. I finally got aroung to putting it on the bike tonight and gave it a try. All the testimonials that I read said the child should be riding on their own within 10 min with no tears. They were right! Dani we are so very proud of you and all you do. This is what I found the other night while I was cooking dinner. Becca had left my side which is a very rare thing in and of itself. When I went looking for her this is what I found. Here we are 10 years and 4 kids later. I know this post is extra long but as I was reminiscing over all the years, the title and the poem at the bottom was a real reality check for me. Hope you enjoy. headed into the Harvest Party with a bunch of very excited kids....can you tell? Ethan, Uncle Trent and Dani. Although you can't tell by Dani's expression the ferris wheel is the highlight of the fair for her. Than refuses to go on this ride so she always has to find someone to take her. does she look like her daddy or what? 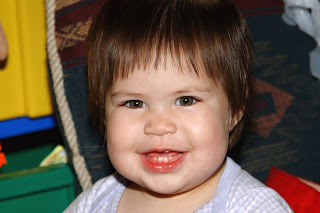 Our sweet Becca Ann came into our family on Jan. 5, 2007. Bailey Grace and Gretchen are exactly 3 months apart. What a size difference. Then came Gretchen. Such a tiny little fighter, when we brought her home she weighed in at 4lbs 15 oz. She still has that look on her face 3 years later. She was born at 38 weeks which is full term. The last time when I hold a bottle to your baby lips.The last time that I lifted you and held you on my hip. The last night when you woke up crying,needing to be walked,When last you crawled up with your blanket,wanting to be rocked. The last time when you ran to me,still small enough to hold.The last time that you said you'd marry me when you grew old. Precious, simple moments and bright flashes from your past-Would I have held you longer if I'd known they were your last? Our last adventure to the park,your final midday nap,the last time when you wore your favorite faded baseball cap. Your last few hours of kindergarten, those last days of first grade, Your last at bat in Little League, last colored picture made. I never said good-bye to all your yesterdays long passed. So what about tomorrow-will I recognize your lasts? The last time that I comb your hair or stop a pillow fight. The last time that I pray with you and tuck you in at night.The last time when we cuddle with a book, just me and you.The last time you jump in our bed and sleep between us two. The last piano lesson, last vacation to the lake. Your last few weeks of middle school, last soccer goal you make. The last time that I help you with a math or spelling test. The last time when I shout that yes,your room is still a mess.The last time that you need me for a ride from here to there.The last time that you spend the night with your old tattered bear. The last time that you need my help with details of a dance.The last time that you ask me for advice about romance. The last time that you talk to me about your hopes and dreams.The last time that you wear a jersey for your high school team. I've watched you grow and barely noticed seasons as they pass. If I could freeze the hands of time, I'd hold on to your lasts. For come some bright fall morning, you'll be going far away.College life will beckonin a brilliant sort of way.One last hug, one last good-bye,one quick and hurried kiss.One last time to underst and just how much you'll be missed.I'll watch you leave and think how fast our time together passed. Dani has started dance class. She absolutley loves it so far. We've only been to one class and she has learned so much. At the bottom are two videos of her dancing. We signed up for Creative Movement with is another term for beginning ballett. Before any formal instruction, unless the Disney channel is considered formal training. I talked my friend Chante and her little boy Wyatt into going up to the Wagons Day parade in Ketchum with me after I swore I would never go again after the last time I went. I'm so glad I went. The weather was awesome although we did get rained on right when we got our of the car. The Wagons Day parade is the oldest and I believe the only non-motorized parade in the U.S. If you have never been it's definitely something to experience. We sat with my brother and his family and several friends. We all had a great time. The Budweiser Clydesdale's. These horses were amazing to see. They are probably some of the most catered animals around. They each ride in their own air conditioned stall and don't come out of the trailer until just about the last minute. They are groomed for 1-2 hours each before each appearance. I was also surprised at all the requirement to be a Budweiser Clydesdale. There are almost as many requirements to be a Cowboy cheerleader. The City of Ketchum has been trying to get them here for the past 2 years and finally got them here for the 50th anniversary. The kids thought it was pretty neat to see someone they new in the parade. Juve Worthington playing the fiddle goes to our church. The amazing 20 hitch mule wagon. The 20 mules are pulling 8 ore wagons that they used to use coming over a very dangerous mountain pass. All tuckered out! This picture is definitely worth 1000 words. 4 kids all asleep, all the same way.